I had mentioned a while back about sharing the skin care routine that I practice daily to keep my skin as healthy and glowing as possible. I then never got around to it and partially for the reason that I was still in the process of testing some crucial products. At last here it is. I have a normal/combination skin type- it usually isn't very dry or very oily and I don't have acne breakouts often. My t-zone area- forehead, nose and chin do sometimes tend to be more oily then the rest of my face depending on the season. Once in a while I will get some dry patches of skin as well but my face tends to be pretty normal with no major extremities otherwise. I have my mom to thank for that being that she and her mother both have pretty amazing skin even as they grow older so I assume it is possible that genetics may have some input there. I feel pretty grateful to say the least knowing how difficult skin issues can be for some. My routine is pretty simple and mostly inexpensive as I purchase most of these items from the drugstore. Once in a while I will try something a little more high end but I don't repurchase unless it is really something unbelievable. I do really like to test new products especially when new seasons come around but when I find something that works really well for me I tend to stick to it no matter what. Here are some of the products that work really well for me for my day and night routine. If you have the same skin type or are perhaps just looking for something new to add to your regimen I would highly recommend trying any of these items. 1. Cleanser and Face Makeup Remover: Every night before going to bed I remove all of my makeup- eyes and face both. Of all the cleansers I've tried in the past years one that stood out the most for me is the Philosophy Purity Made Simple Cleanser and I have mentioned how much I love it quite a bit here on the blog. To my dismay I ran out recently. I decided to try something new and I have started with the Loreal Youth Code Foaming Gel Cleanser, Drugstore.com $5.99 I will be repurchasing the one from Philosophy some time soon as it is still my number one cleanser for a quick makeup removal. The Loreal one is fantastic though and has replaced it in the mean time. I love it's fresh scent. I wet my face with cold water and take a pump or two from the bottle on my fingertips and massage it into my face. I then let it sit there for a moment or two to really remove my makeup and cleanse my pores deeply. Then I clean it off with a clean wet washcloth. It gives my face such a clean tingly feeling that makes taking my makeup off a wonderful part of my routine. This is not only the product I use to remove my makeup and cleanse my face at night but in the morning as a daily cleanser as well. 2. Eye Makeup Remover: I have to say I have tested so many eye makeup removers from makeup wipes to all sorts of gels and oils all of which either didn't work well enough or didn't work at all (I had a terrible experience with Mac Cleanse off oil- a product that was highly recommended to me in any case). Sonia Kashuk's Remove Eye Makeup Remover, Target: $10.19 is by far the best I have ever used. I start by dampening my eyelids and then take just a little bit of the product on a piece of soft tissue and gently wipe off all of the eye makeup. Waterproof products included! It is a pleasure. No rubbing, tugging or pulling, it comes off smoothly without causing my eyes any discomfort. The one thing that is kind of annoying with this product is that it doesn't have a pump. I have to be really careful with it since it's just a screw on lid and with one knock I could easily lose all of the product in a spill. I hope the packaging gets reformulated with a pump or perhaps I will just purchase a disposable one. Deep Cleansers:These next two products are ones I use less often. They are great for the rare breakout and for giving my pores a good deep cleaning when I need it. I tend to switch off between the two using one of them each not more then twice a week at the very most. 3. The Clean and Clear Continuous Control Cleanser, Soap.com $5.99 is one I have been using for over 4 years now and I have repurchased it several times. Whenever the rare pimple appears I will use this before bed like my other cleansers spreading it over my face leaving it for a moment or two and then rinsing it off and by morning there is usually no sign of redness or pimples etc. The only thing I would warn about is that it is a pretty harsh formula so it may not be good for those with really sensitive skin. Also something that annoys me is that the cap doesn't close after a few times of opening it and that has happened with many of the ones I've purchased previously but for the price I can't really complain. 4. The Freeman Facial Clay Mask in Chocolate & Strawberry Ulta, $3.99 is a product I opt for when my T-Zone feels a little oily. I have always loved masks and after trying a smaller packet from Rite Aid in avocado oatmeal I knew I needed to get the large size. This one smells exactly like a piece of chocolate and makes me hungry every time I use it ;) I spread it over my skin leaving it there for about 5 minutes and letting it dry into a mask. I then rinse it off. I often see a difference in my skin right away. My pores seem smaller, less oily and really clean! I like using this when I'm in the mood of relaxing and pampering myself after a long stressful day. Moisturizers: After cleansing my skin I always moisturize both in the morning and at night. These are the three that I am favoring right now. Because I can sometimes get oily in my t-zone area I avoid using heavy moisturizers but I do like to use something light that still works well in helping my skin stay soft and hydrated. 5. The Aveeno Acfive Naturals Ultra Calming Daily Moisturizer SPF 15, Walgreens $16.99 is what I use after cleansing my skin in the morning. I have hyper pigmentation and ruddiness in my cheeks so I like to use a product that can calm some of that redness and I have found that this works very well in that aspect. It isn't heavily scented and very little does so much. I bought this 4 oz. bottle over a year ago and have still not finished it. 6.The Jergens Natural Glow Revitalizing Daily Moisturizer For Fair to Medium Skin Tones, Drugstore.com $8.19 is a product I use in the Summer time every day to build up color while lightly moisturizing my face at the same time. In the Autumn and Winter time I use it on my face less often going for less of a tanned look and more of that nice glowy look. I originally tried the one for medium to dark skin tones but it smelled too heavily of self tanner for me. I find that this one for fair to medium skin tone smells far better and works just as well. I like that it gives me some color/glow and moisturizes/primes my skin for makeup very well at the same time. I switch off between the Aveeno one and the Jergens one depending what results I am looking for. 7. The StriVectin Power Serum for Wrinkles, Sephora $99.00 this product is supposed to plant peptides and stem cells that work together to reduce the size of pores and wrinkles. It is the product I use just before going to sleep. Obviously I am still very young and I'm not fighting major wrinkles but I feel like it's never too early to start preparing the skin to be healthy and less aged looking as I grow older. I use very little of this product and spread it into areas that naturally crease and leave it on the skin to work overnight as I sleep. I would love to find something similar for less expensive that works just as well but as of now I feel like this is the perfect night time serum to suit my needs. Two extra items (not photographed) that I use are: One is the Aquaphor healing ointment- I use it on my lips both at night before going to sleep and in the morning when I wake up to avoid dry cracked lips especially in the colder months. It keeps my lips nice and smooth. And the second thing is, I always make sure to apply sunscreen or a foundation with built in SPF all year round to protect my skin from the suns harmful rays. 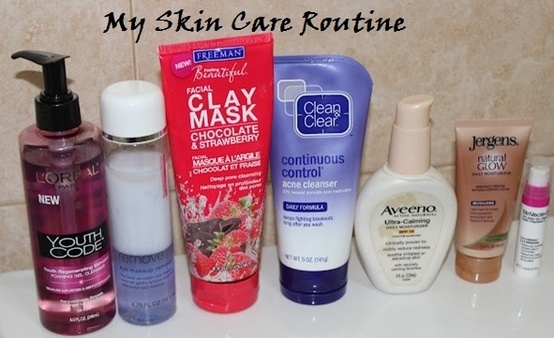 So those are some of the products that work really well for me in my daily skin care routine. I hope it can be helpful to you if you are looking for something new. Do you have some skin care products that work well for you and that you would recommend to me? Please let me know in the comments form below. I love trying new items and I really love to hear from you. Don't forget to subscribe if you haven't already by email, with google connect or bloglovin' to stay updated. Have a wonderful Shabbos and a Happy Sukkos to all!